Singing doesn't come easy when the baton rests with the powerful and mighty. People of Cordillera, the Philippines are today seeking ways to fight back this situation. The Abra, Spanish for 'a place surrounded by mountains' or 'a valley' has had ancestral importance for the people. The 11 ethno-lingusitc groups that reside along the Abra river look upon the Abra as 'life', which sustains them, providing resources for farming and fishing. 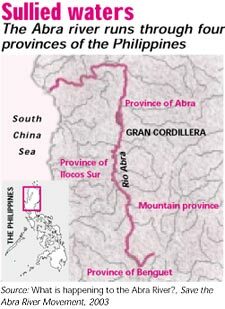 The 178-kilometre long river travels through the Cordillera provinces of Benguet in the north, to Mountain Province in the south, and Ilocos Sur southwest before it empties into the Luzon Sea. Rich in mineral deposits, the Cordillera region has an estimated 1,964,060 metric tonnes of primary gold reserve and over 960,634,900 metric tonnes of primary copper. But farming has been the primary occupation of the people in the Cordillera provinces. The mountain terrain allows for rice terraces that cover over 23 per cent of the total area. Unfortunately, since the formation of the Philippine State, after American colonisation, 'exploitation' of the region's resources has been blanketed under the term 'national development'. The Lepanto Consolidated Mining Corporation (Lepanto) has been copper-mining in the region since 1930, the effects of which have percolated into the Abra river. Since copper mining gave minimal returns, Lepanto turned to gold mining in 2001. Over 38,320 households are threatened by expansion of the mining giant. The Abra today has become a convenient dumping ground for Lepanto with over 1,500 tonnes of waste accumulating in the river bed, a single day. With with the building of tailing dams, the land grew unsuitable for agriculture. The collapse of a tailing dam led to lands being eroded, schools submerging and pollution doubling. Lepanto's operations had decreased agricultural yield, deteriorated aquatic life and killed domestic animals. Mining lets out 'metal rich water' called Acid Mine Drainage (amd), which is released from the surface and underground mine workings, waste and development rocks, tailing piles and tailing ponds. This amd has high levels of harmful lead, cadmium and copper. The cyanide used in gold extraction has been seeping underground. A teaspoonful of two per cent cyanide is enough to kill a human and a concentration as low as five milligrammes cyanide per litre of water can restrict fish reproduction. Lepanto uses over 3,000 kilogrammes of cyanide every 24 hours. This hazardous degradation brought together a collective body of elders, members of non-governmental organisations and the scientific community to establish the Save The Abra River Movement (starm). The studies they did to check pollution levels in the Abra were funded by Lepanto and therefore any allegations against the company were effortlessly denied. According to starm, liberalisation of the Philippine mining industry has exhausted the country's mineral resources and infringed upon rights of the indigenous groups to these resources. starm has called for a moratorium on large-scale mining in the region. They are aiming at making these mining corporations and the Philippine government aware of the rights the indigenous people have to their land. The local people have lost faith in the government agencies and the judicial system. A 65-year-old resident, Perfecto Lasa says Lepanto does not follow the government requirement that mining companies must drill at least 150 metres below the ground surface. "It was in 1983 when a gaping hole appeared in the bottom of the river. The water flowed into this tunneling leading to cracks along the walls in homes and roads began to sink." starm has been organising seminars, holding exhibitions and slide shows, making people aware of the impacts of mining on bio-diversity and health.